The French revolution was under way by 1789, and on the 21st. of January 1793 the French King Louis XVI, faced the guillotine. The French army overran the southern Netherlands, and Britain went to war against the French to start the Napoleonic war which continued until 1815 when Wellington finally defeated Napoleon at Waterloo. 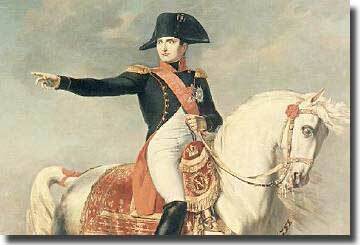 Napoleon, the arch enemy of Britain, and in danger of taking the whole of Europe under his control. Toulon fell to Napoleon in 1793, Spain sued for peace with France to become her Ally. Nelson was sent off to cover the evacuation of British personnel from Leghorn to Elba. Two convoys were to sail by separate routes to Gibraltar hoping to evade the French fleet, and Nelson in Minerve, with Romulus in company took the coastal route via Toulon, all was normal there, so he pressed on to Cartagena, no Spanish fleet there in port, they were at sea, and he needed to warn his Admiral, Sir John Jervis that the Spanish fleet were out. In fact they had passed through the Straits of Gibraltar on the 5th. of February, and Nelson was some 6 days behind them. Sir John Jervis in command at St Vincent in his flagship HMS Victory. 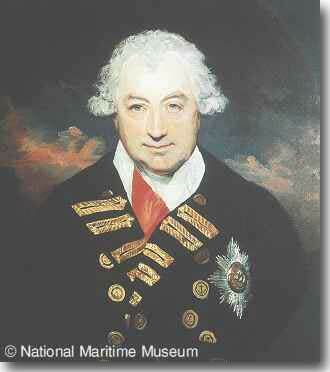 My 1936 Royal Australian Naval College entry were named the Jervis Year, after this famous British Admiral. He was to become Earl St Vincent, after the victory of the British ships at the Battle of St. Vincent. The British were no longer maintaining a fleet in the Mediterranean, and Sir John with his 15 ships was off Cape St. Vincent, whilst the Spanish fleet had sailed into the Atlantic, their aim, to make their way to Cadiz. 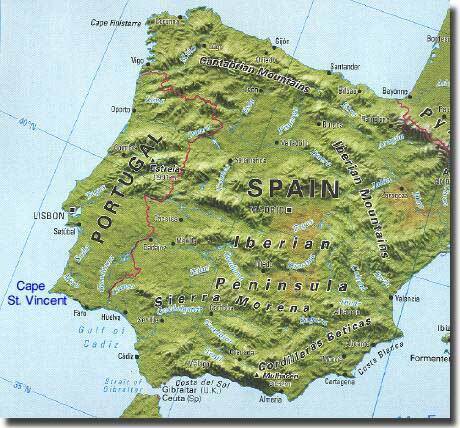 Battle of St. Vincent, Cape St Vincent, Cartagena, The straits of Gibraltar and Cadiz. On the 11th. of February, Nelson in his ship Minerve passed through the Spanish ships, their sleepy lookouts unaware of the British ship. By the 13th. of February Nelson had found his Admiral to report that the enemy Spanish ships were in fact, close by. The stage was set for a Naval Battle that England had to win, but against a superior enemy in both ship numbers and guns mounted in them. 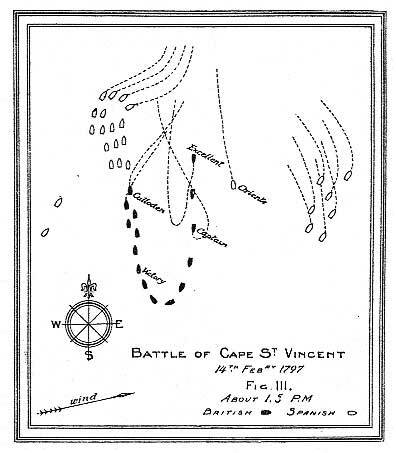 the Battle of Cape St Vincent. 14th. of February 1797. 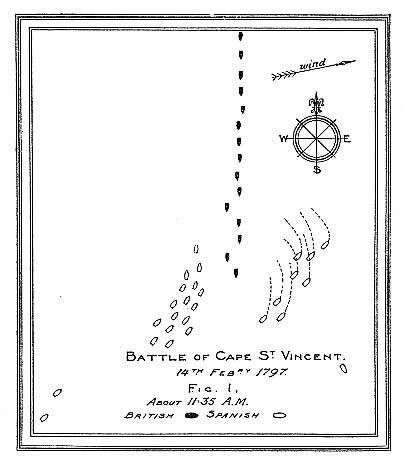 Battle of Cape St.Vincent. 14th. of February 1797. During the night of the 13th./14th. of February 1797, the British ships could hear the Spanish signal guns in the enveloping fog, and at 0250 ( 2.50 AM ) the enemy ships were but 15 miles away. Come the dawn of the 14th. Sir John's ships were formed into two columns with Captain Trowbridge in the lead with Culloden, and at 0630 ( 6.30 AM ) he could count 5 enemy sail off to the South East. On the quarterdeck of the flagship Victory, officers were straining to count the enemy ships, to come up with 27, almost double that of their own fleet. The Spaniards were in two loose columns, one consisting of 18 ships, and one group of perhaps 9 ships, somewhat closer to the British Fleet. At 1100 ( 11 AM ) the British Admiral ordered: " Form line of battle ahead and astern of Victory as most convenient." The British ships in a single line of battle were sailing southerly, setting a course to pass between the two Spanish groups. 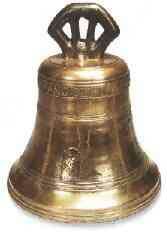 At 1112 ( 11.12AM ) Jervis ordered his signalman to hoist " Engage the enemy. " and a little later, at 1130 ( 11.30 AM ) to ensure his Captains would be under no illusions, hoisted " The Admiral intends to pass through the enemy lines." 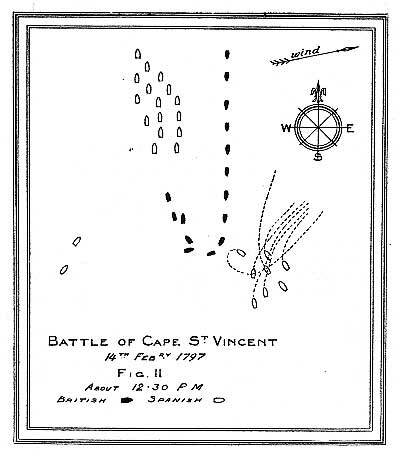 The Battle of Cape St. Vincent was on in earnest! The lead ship Culloden opened fire as her guns came to bear, each ship following her did likewise as they too came into range, and, as soon as Culloden passed the last Spanish ship, she tacked to come about and be behind the Spaniards. Blenheim and Prince George did the same in succession. Now sensing the danger of being totally isolated from the action, the Spanish ships to leeward went onto the port tack intending to break open the British line which seemed to be vulnerable at the point where they were tacking in succession. Orion tacked, but Colossus following her, had her fore yard and fore top yard shot away forcing her to wear ship rather than tacking, she was in mortal danger of collecting a Spanish broadside, but Saumarez in Orien was quick to sense this danger and backed his sails to give Collossus covering fire. Now it was Victory's turn to tack, and yet one more attempt was made by the leeward ships to break up the British line, but Jervis in his flagship was too quick for them, and gave the leading Spanish three decker a broadside. The last British ship tacked and now with Culloden in the van, leading the U shaped formation, they chased after the fleeing Spanish ships. The Spanish lee group bore up to try and join up with their ships to windward, if they could achieve that, the British would be faced with a stern chase just as had happened with the Spanish Armada back in 1588. Sir John Jervis now signalled: " Take suitable stations for mutual support, and engage the enemy as coming up in succession." Now, Commodore Horatio Nelson in Captain, 3 ships from the British rear of the line, quickly realised that all would be lost unless the movement of the Spanish ships to windward could be impeded. He passed between Excellent and Diadem to sail across the bows of the Spanish ships forming the central group of this division. Captain carried 74 guns, the Spanish group included Santissima Trinidad of 130 guns, San Josef with 112, Salvador del Mundo with 112, San Nicholas with 84, San Ysidro with 74 and Mexicano carried 112 guns, a formidible group, all but one out gunning Captain. Nelson was indeed courting disaster, and possible annilhilation of his command, he was placing himself and his career at risk, he would face a court martial if he failed. Three other British ships came up astern of the group being pursued to block any attempt by the windward group to join up with their compatriots. Captain was under intense fire, but now British ships attacked the Spaniards and San Ysidro hauled down her flag in surrender, as did Salvador del Mundo. Nelson's ship had her foretopmast topple over the side, the ship almost out of control, but her Captain managed to get her alongside the Spanish San Josef. Nelson now ordered: " Borders Away. " leading them with the cry: "Westminister Abbey or Victory." Nelson, as he led the boarding party to the Spanish San Joesf, his comment: Westminister Abbey or Victory. The British Fleet ordered to take up Station in line astern of Victory. 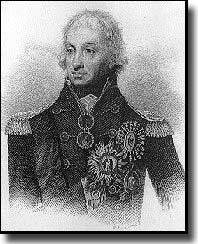 Admiral Sir John Jervis ordered his ships to " Take up station in line astern of Victory." The battle was indeed over, victory conclusively won by the British. 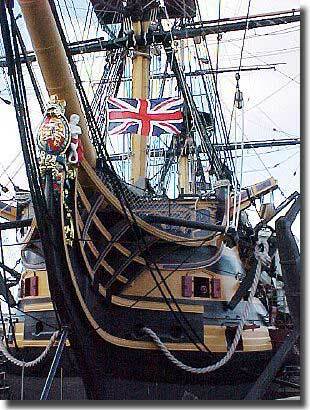 Nelson was certainly the springboard for this success, whereby 15 ships of theRoyal Navy defeated some 27 of the Spanish. Sir John was created Earl St.Vincent, Commodore Horatio Nelson, became Sir Horatio Nelson, and he learned that he had been promoted to full flag rank as a Rear Admiral. Nelson of course went on to win the Battle of the Nile where he decimated the French Fleet in 1800, trapping Napoleon in Egypt, and blocking his ambition of taking India from the British. Then in 1805 came Nelson's famous victory at Trafalgar where he was to be killed, but his skill in battle at sea ensured that Britain retained her mastery at sea for many years to come. 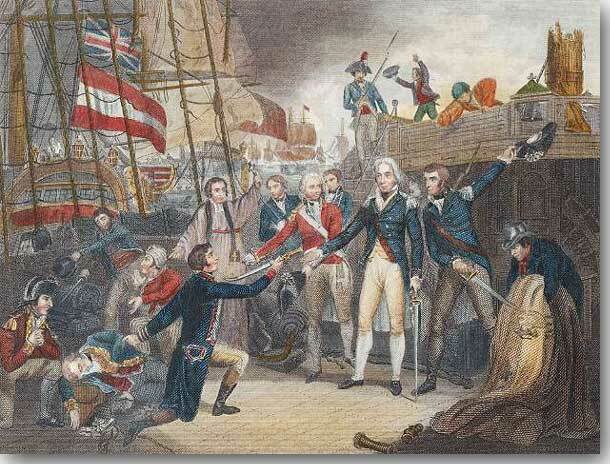 Nelson receives the Spanish Admiral's sword on board San Josef. h. Century print. 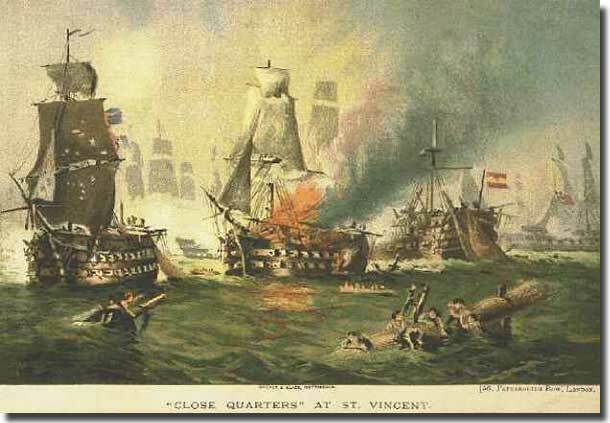 The Battle of Cape St.Vincent was well and truly won through flair, boldness, courage, and the quick action of Nelson to block the Spanish windward ships, and thus prevent them from joining up with their colleagues and escaping to Cadiz. 1. Admiral Sir John Jervis's despatches to the Admiralty after St. Vincent. Victory. in Lagos Bay, February 16th, 1797. Sir, The hopes of falling in with the Spanish fleet, expressed in my letter to you of the 13th instant, were confirmed that night by my distinctly hearing the report of their signal-guns, an by intelligence received from Captain Foote of his Majesty's ship the Niger, who had, with equal judgment and perseverance, kept company with them for several days, on my prescribed rendezvous (which, from the strong south-east winds, I had never been able to reach), and that they were not more than the distance of three or four leagues from us. I anxiously awaited the dawn of day, when, on the starboard tack, Cape St. Vincent bearing east by north eight leagues, I had the satisfaction of seeing a number of ships extending from south-west to south, the wind then at west and by south. At forty-nine minutes past ten, the weather being extremely hazy, La Bonne Citoyenne made the signal, that the ships seen were of the line, twenty five in number. His Majesty's squadron under my command, consisting of fifteen ships of the line, happily formed in the most compact order of sailing in two lines. By carrying a press of sail, I was fortunate in getting in with the enemy's fleet at half past eleven o'clock, before it had time to command, and judging that the honour of his Majesty's arms and the circumstances of the war in these seas required a considerable degree of enterprise, I felt myself justified in departing from the regular system; and passing through their fleet in a line, formed with the utmost celerity, tacked, and thereby separated one-third from the main body, after a partial cannonade, which prevented their rejunction till the evening; and by the very great exertions of the ships who had the good fortune to arrive up with the enemy on the larboard tack, four ships were captured, and the action ceased about five o'clock in the evening. I enclose the most correct list I have been able to obtain of the Spanish fleet opposed to me, amounting to twenty seven sail of the line; and an account of the killed and wounded in his Majesty's ships, as well as those taken from the enemy. The moment the latter (almost totally dismasted), and his Majesty's ships the Captain and Culloden, are in a state to put to sea, I shall avail myself of the first favourable wind to proceed of Cape St. Vincent, in my way to Lisbon. Captain Calder, whose able assistance has greatly contributed to the public service during my command, is the bearer of this, and will more particularly describe to the Lords Commissioners of the Admiralty the movements of the squadron on the 14th and the present state of it. I am, &c J. Jervis Recent research evidence suggests that the numbers of Spanish vessels quoted by Jervis (and subsequent reports of the battle) may be higher than were actually involved. It now appears (evidence from Spanish sources) that the likely number of vessels in the Spanish line was 23, and that one of them was only lightly armed if armed at all. In the confusion of battle, and with the Spanish in two divisions, it is understandable that Jervis may have counted more ships. Jervis was still outnumbered - and it must be remembered that some of the Spanish ships were of considerable size and firepower. 2. Nelson's account of the Boarding Party's actions.